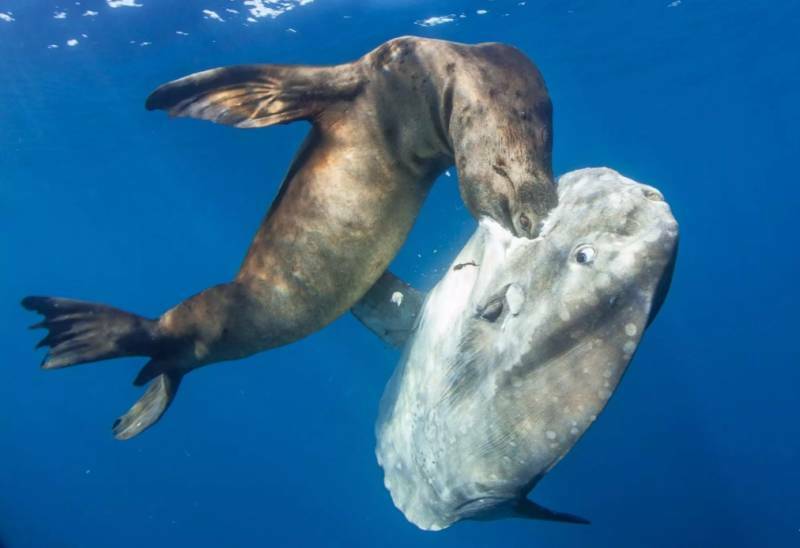 Nine miles off the San Diego coast in the open blue waters of Nine Mile Bank, a California sea lion (Zalophus californianus) plunges head first into the tough flesh of Earth’s largest bony fish: an ocean sunfish (Mola mola). The mola, a graceful behemoth that can grow up to 3.1 meters (10 feet) in length and 4.2 meters (14 feet) from fin tip to fin tip, spends much of its time basking at the ocean’s surface, one eye pointed skyward. Drawing warmth from the sun helps molas recover from cold, deep dives — often to depths of nearly 800 meters (2600 feet) — where they forage for invertebrate prey such as jellyfish. With its lethargic movements through the water and no obvious defense mechanisms, the mola would almost surely be more vulnerable to predators if not for its thick, sandpaper-like skin. Typically, only orcas dare to attack and consume adult molas. But climate conditions off the California coast have been anything but typical in recent years. This trend coupled with the effects of El Niño has caused unusually warm waters to persist throughout vast swaths of the eastern Pacific. Fish like sardines and anchovies that sea lions typically favor as prey have migrated farther north in search of cooler waters. When photographer Ralph Pace first encountered this underwater scene, he immediately noted the peculiarity of the sea lion’s food choice. Initially, Pace struggled to capture a shot amidst the chaotic battle for survival, but for one moment, the scene calmed and the mola, still alive, seemed to look its predator in the eye as if pleading for its life. This photograph was selected as a finalist in the California Academy of Sciences’ 2016 BigPicture photography competition. This story comes from Biographic, an online magazine published by San Francisco’s California Academy of Sciences.